A manual of constructional details which shows how successful results in acoustic design can be achieved by correct use of building materials, products and components. Details are drawn to scale and carry informative labelling and supplementary text. 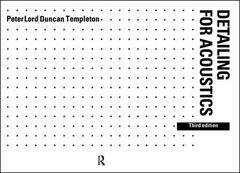 This updated and revised edition of an established reference book, in an improved format and layout, will be a welcome addition to current reference works on acoustic design. Chapter One: Objectives. Chapter Two: Sound insulation: Airborne sound insulation, Roofs, Ceilings, Partitions, Walls, Floors, Doors, Windows, Barriers screens, Impact sound insulation. Chapter Three: Sound absorption, reflection: Sound absorption, reflection, Reflectors, Ceilings, Wall finishes, Installations, furnishings. Chapter Four: Services: Criteria, Ducts pipes, Vents, lighting, lifts, plantrooms, Louvres, screens.